While working as a UX designer at DV:UX, I had the opportunity to contribute to Adobe FormsCentral. 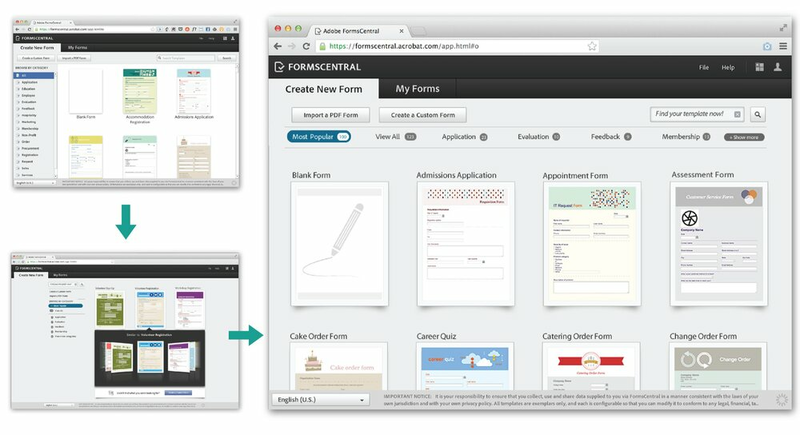 FormsCentral is an Adobe web-based form creation application. The application allows users to distribute forms digitally, collect form data and create or customize forms and form templates. I primarily worked on visual designs for the template section and new work flows for the form creation UI. Our goal was to create a less intimidating appearance, specifically in regards to the "custom-form" workflow. We offered suggestions to improve the user experience with respect to initiating a new form, as well as the template display UI, which was originally an overwhelming interface. We also created a new calculation tool, which would allow users to create automated fields such as "total amount owed". Additional UX components that I worked on during this project include the submit button work-flow, the page break design & interaction, and the initial “getting started” work-flow. I also produced assets and pixel specs for these designs.